Flingers features a unique and innovative way to launch weapon projectiles. Leonardo and Michelangelo fling sewer lid and pizza discs from their chest! Donatello and Raphael throw bo’s and sais over their shoulders! Each figure includes 3 bo’s and sai’s. Each figure includes 10 discs. Each sold separately. Please search code 128900 to check stock availability in our stores. 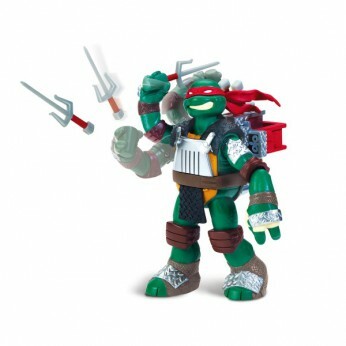 This toy costs approximately £11.99 (for the latest and best prices make sure you check our retailer list for the Turtles Flingerz Figure Raphael above). In our review of Turtles Flingerz Figure Raphael we classed it as being suitable for ages 3 years, 4 years, 5 years but recommend you check the manufacturer specific advice before purchasing.